Well, after reading Zero Gravity, I wanted to read another volume of short stories, so I got Breaking Waves out on my Kindle and read away. The idea for this collection started in the aftermath of the BP oil spill in the Gulf. Phyllis Irene Radford wanted to do something, so she came up with an idea of collecting stories which would benefit the aid effort, "fighting oil with ink," as she puts it. What resulted was a rather large collection of short stories and poems written by many accomplished authors. The first submission was by Ursula K. Le Guin, and that was followed by other Hugo and Nebula award-winning authors, environmental writes, and authors who were at the scene of the spill or during Hurricane Katrina's devastation. But where the collection succeeded, boy did it succeed! The stories which stood out are ones in which the authors did not write about the disatsters, did not preach on keeping a green world, but wrote about people dealing with the disaster. One of my favorites was "Disaster Relief," by Kristine Kathryn Rusch. This is a story about Katrina, but which takes place on the Oregon coast. The protagonist, WInston, is a feebly gifted mage, who with his familiar, is concerned about his own welfare should a tsunami hit the beach after watching the coverage of the Boxer Day Tsunami in Thailand and Indonesia. When Katrina hits, this private, reclusive mage, a man who prefers to help others through small donations, is goaded into helping a professional colleague by his familiar, a cat named Ruby. The colleague lost his shop in New Orleans, and Winston, going against his nature, invites him to join him out in Oregon. The colleague agrees, but when he comes, he brings along several other mages as well. The story is superb in describing Winston's feelings, wanting his guests out of his house so he can get back to normal, then his guilt in feeling that way. Ruby's nervousness and discomfort are well described as well. I read that there is a novel coming out about Winston and Ruby. I eagerly await its publication. "Javier Dying in the Land of Flowers," by Deborah J. Ross, writing as Deborah Wheeler, was not centered around any specific natural disaster. Oh, it takes place in a period of global warming, but the story is about Javier, a young Hispanic man who has wangled a job as a domestic at a secluded resort for the rich. With a real job, he has escaped the squalor and crime of his life, able to help his family. But when his health gets in the way, the despair of his situation cries out from the pages. Another global warming tale is "Terra Incognita," by Camille Alexa. Once again, there is no preaching here, just the story of a US Park Ranger stationed in Antarctica, alone as financial shortfalls cut off major research by other nations, and as the continent's water resources are looked upon with longing eyes by a thirsty world. Alexa's ability to evoke strong emotions without coming on too strong are really noteworthy. And while not the type of story to which I usually gravitate, "A Little Song, a Little Dance," by David D Levine and Andrine de la Rocha, was an evocative tribute to those who died during Katrina. I felt my emotions being pulled by the story, where an aging juggler with a troupe of performers is able to assist those who passed to continue on in their journey. Despite the weak stories (such as "Emergency" by Nancy Jane Moore, which was hardly even worthy of a high school effort), the gems in this collection make it a must read. 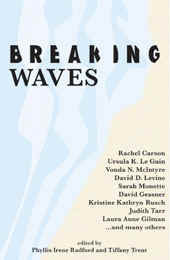 For more reviews or to buy Breaking Waves from Amazon.com, click here.